Join the Center for Place, Culture and Politics at the CUNY Graduate Center and the CUNY School of Labor and Urban Studies as we discuss Andrew Ross’ recently published book, Stone Men: The Palestinians Who Built Israel. Andrew Ross will present his book and discuss the broader themes raised in the work, including how states exploit and displace workers essential to building those states, as well as what governments might do to recognize this labor and protect workers. Joining him in conversation are Ashley Dawson of the College of Staten Island and the Graduate Center, Cindi Katz of CUNY Graduate Center, and Stephanie Luce of the CUNY School of Labor and Urban Studies and the CUNY Graduate Center. This is how a Palestinian stonemason, in line at a checkpoint outside a Jerusalem suburb, described his life to Andrew Ross. Palestinian “stone men,” using some of the best-quality limestone deposits in the world and drawing on generations of artisanal knowledge, have built almost every state in the Middle East except one of their own. Today the business of quarrying, cutting, fabricating, and dressing is the Occupied Territories’ largest private employer and generator of revenue, and supplies the construction industry in Israel, along with other countries in the region and overseas. Ross’s account of this fascinating ancient trade shows how the stones of historic Palestine, and Palestinian labor, have been used to build the state of Israel—in the process, constructing “facts on the ground”—even while the industry is central to Palestinians’ own efforts to erect bulwarks against the Occupation. For more than a century, the hands that built Israel’s houses, schools, offices, bridges, and even its separation barriers have been Palestinian. Looking at the Palestinian–Israeli conflict in a new light, this book, largely based on field interviews in the region, asks how this record of labor and achievement can and should be recognized. Andrew Ross is Professor of Social and Cultural Analysis at New York University, and a social activist and analyst. He has authored and edited numerous books, and written for The New York Times, The Guardian, The Nation, Newsweek, and Al Jazeera. Ross is also an Editorial Board Member of the New Labor Forum. Much of his writing focuses on labor, the urban environment, and the organization of work, from the Western world of business and high-technology to conditions of offshore labor in the Global South. Making use of social theory as well as ethnography, his writing questions the human and environmental cost of economic growth. 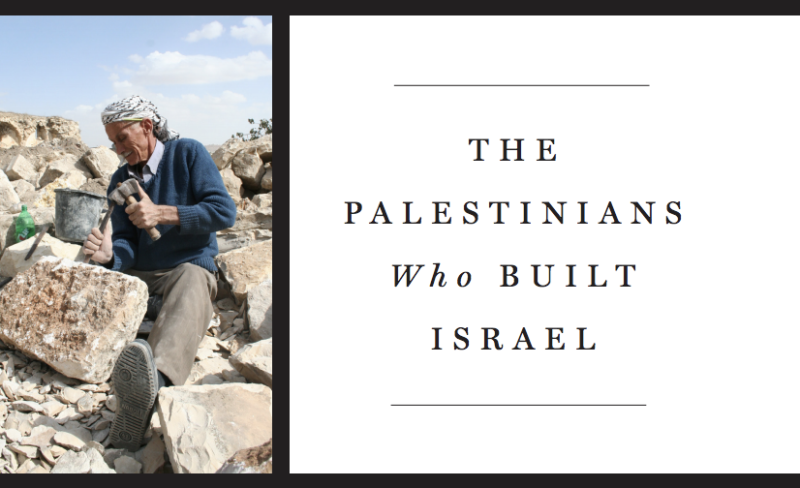 Ross is the author of Stone Men: The Palestinians Who Built Israel, among many other books. Ross received his PhD from the University of Kent at Canterbury. Ashley Dawson is Professor of English at the CUNY Graduate Center and the College of Staten Island-CUNY. Dawson specializes in postcolonial studies, cultural studies, and environmental humanities with a particular interest in histories and discourses of migration. He has also worked recently on contemporary discourses of U.S. imperialism and on the movement for climate justice. Dawson’s work has been published in many academic journals, and he is the author of several books, including Extreme Cities: The Peril and Promise of Urban Life in the Age of Climate Change, and Extinction: A Radical History. He also co-edited a volume of essays titled, Against Apartheid: The Case for Boycotting Israeli Universities. Dawson received his PhD from Columbia University. Cindi Katz is a cultural geographer, teaches at the Graduate Center in Earth and Environmental Sciences, Environmental Psychology, Women’s and Gender Studies, and American Studies. Her research addresses social reproduction and the production of space, place, and nature; the intertwined spatialities of homeland and home-based security; the cultural politics of childhood; and the consequences of global economic restructuring for everyday life. Katz has published widely on these themes as well as on social theory and the politics of knowledge in various edited collections and journals, and is the author of several books including the award winning, Growing Up Global: Economic Restructuring and Children’s Everyday Lives. Katz received her PhD from the Graduate School of Geography at Clark University. Stephanie Luce is Chair and Professor of Labor Studies at the CUNY School of Labor and Urban Studies, and Professor of Sociology at the CUNY Grad Center. Her research focuses on low-wage work, globalization and labor standards, and labor-community coalitions. She is the author of Labor Movements: Global Perspectives, Fighting for a Living Wage, and co-author of The Living Wage: Building a Fair Economy. She is co-author of A Measure of Fairness; and co-editor of What Works for Workers? Public Policies and Innovative Strategies for Low-Wage Workers. She has published numerous reports on labor and wages in the New York City area, including the annual “State of the Unions” report co-authored with Ruth Milkman. Luce received her PhD from the University of Wisconsin at Madison. Co-sponsored by the Center for Place, Culture and Politics and the CUNY School of Labor and Urban Studies. This event is free and open to the public. This entry was posted in Book Event, Events by Esra Padgett. Bookmark the permalink.